A Rebuttal to New Urbanism. Marina-City-Club.jpg, originally uploaded by Here in Van Nuys. These are buildings which comprise the Marina City Club, a development built in the late 1960s. Recently, I’ve spent lots of time in this sprawling complex. To enter, you must first drive past a guard station. Everyone who enters here drives up. There is no central lobby in each building. One drives up a circular ramp, parking in a space and then you walk to the nearest elevator. 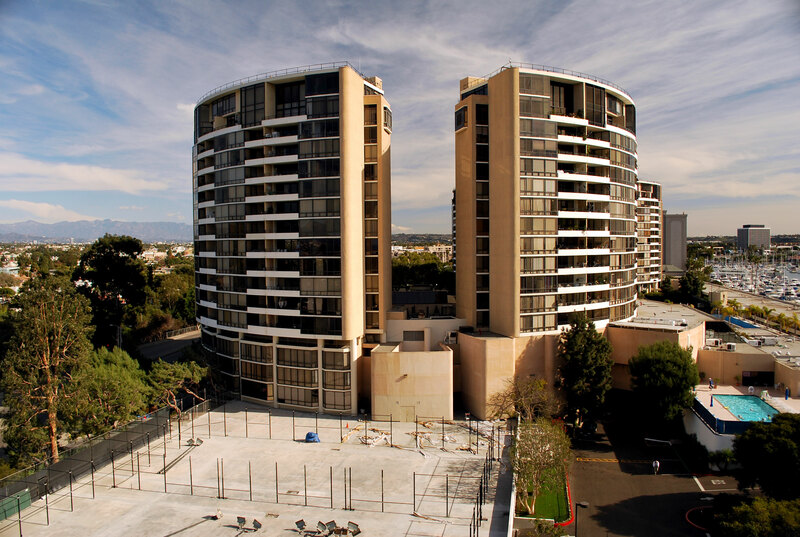 The apartments are large and have panoramic views of the harbor and the skyline. As an architectural critic and liberal urbanite, I should despise these structures. They are built around the car, designed so the pedestrian must walk through a spiral parking garage and unceremoniously enter the buildings by riding up an ugly elevator into a concrete open air hallway. Yet, the community here is remarkably caring and friendly. Everyone says hello and people hold the elevator door open for their neighbors. Maintenance is swift and things get repaired fast. Security is watchful. There is a local restaurant, a dry cleaners, a movie theater, a gym, pools, tennis courts, a fitness center. We imagine that architecture can impart some moral dimension to the behavior of mankind, but somehow people manage to behave differently than those mythical suppositions of planners and architects often intend. The alienation apparent in the car-centered, anti-walking design of the Marina City Club is nowhere to be found. ← Obama, Spending, Sprawl, Infrastructure…… and David Brooks.